From Goodreads: Love is awkward, Amelia should know. From the moment she sets eyes on Chris, she is a goner. Lost. Sunk. Head over heels infatuated with him. It’s problematic, since Chris, 21, is a sophisticated university student, while Amelia, is 15. Amelia isn’t stupid. She knows it’s not gonna happen. So she plays it cool around Chris—at least, as cool as she can. Working checkout together at the local supermarket, they strike up a friendship: swapping life stories, bantering about everything from classic books to B movies, and cataloging the many injustices of growing up. As time goes on, Amelia’s crush doesn’t seem so one-sided anymore. But if Chris likes her back, what then? Can two people in such different places in life really be together? Through a year of befuddling firsts—first love, first job, first party, and first hangover—debut author Laura Buzo shows how the things that break your heart can still crack you up. I have blind faith in the ability of Aussie authors to write amazing contemporary young adult novels. Melina Marchetta, Cath Crowley, and Lucy Christopher are a few of my favorite examples, and now I get to add Laura Buzo to my Awesome Authors From Down Under list. Her debut, Love and Other Perishable Items, is absolutely delightful. Love is a quiet sort of book, one that builds its characters and their relationships slowly. It’s the kind of book you don’t realize you’re falling for until you’re nearly done. In other words, Love is my favorite kind of story: slow-burn, full of longing and wit, populated by vibrant, dynamic characters, and with authentic voice that leaps off the page. Amelia is a sweetheart, and just as uncertain about life’s complexities as I was at fifteen. She’s smart and thoughtful and she knows what she wants — Chris — but she’s not exactly sure why she wants him, or what it would mean if she were to actually get him. And Chris, while idealized in Amelia’s adoring eyes, is simply a flailing, flawed, immature university student. But, flailing, flawed, and immature as he is, Chris is a charmer. He’s intelligent and fun, and he has an effortless way of engaging people. I understood why Amelia placed him on a pedestal, and I was totally engrossed in the saga of their complicated, somewhat lopsided friendship. One of my favorite things about Love and Other Perishable Items is its ending. As the story began to wrap up, I desperately wanted Amelia and Chris to find happily ever after, even if their respective happily ever afters weren’t immediately intertwined. The story’s resolution is honest and realistic and hopeful all at once, and it left me wanting to check in with Amelia and Chris ten years down the line to see how their lives turned out. 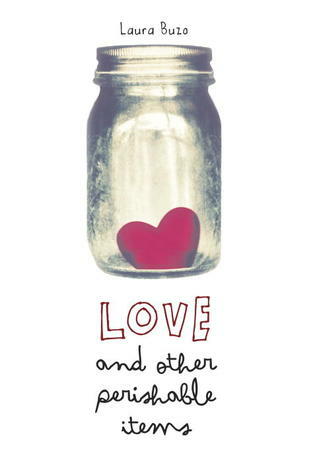 Love and Other Perishable Items is the perfect book for fans of contemporary YA, especially those who remember those first feelings of unrequited love, appreciate nuance and authenticity, and enjoy an Aussie setting. Tell me… What’s the last contemporary YA you read and loved? This one has been on my radar for awhile – thanks for the review! It was on my radar for awhile too… So glad I finally picked it up! This looks wonderful! Putting it on my TBR – thanks for the rec! My pleasure, Tem. I feel the exact same way when I read your middle grade recommendations. So many fabulous books, so little time to read! I bet you’ll enjoy it, Ghenet… In my opinion, it’s the best kind of contemporary! It would make fantastic wall art… I hadn’t even thought of that! I recently read the description for this book and wondered how the author would approach the age difference between the characters, seeing as one is a minor and the other is an adult. (I’m assuming both Australia & the US have similar laws to Canada on this.) The idea of a fifteen-year-old having a crush on a guy who’s twenty-one is certainly realistic, but I wondered about the complications an actual relationship could bring about. It made me really curious how Laura Buzo would end the story. Sounds like she must have done a good job of it! I wondered about the age gap too. I love a steamy romance, but the idea of a fifteen-year-old and a twenty-one-year old together gave me pause. I’m happy to say that the whole thing is handled very tactfully and gracefully. At no point during the story did I feel squeamish, though the emotions of the main characters rang very true. This subject matter involves some precarious balancing, I think, and Laura Buzo totally pulled it off. You’ll have to let me know if you agree if you decide to give LOVE a read, Erin. Me too, Cory! You’ll have to let me know what you think if you get around to reading it. I’ve been reading primarily MG and children’s books lately, since I’m taking Children’s Lit this semester. I’ve really enjoyed the upper MG contemporaries I’ve read so far (of my own choosing), like Jennifer Holm’s Middle School Is Worse Than Meatloaf: A Year Told Through Stuff, and Rachel Renée Russell’s Dork Diaries series. They seem like they could easily go either way, upper MG or lower YA. Oh! This sounds right up my alley 😀 I’ve seen it on Amazon but I didn’t buy yet it. After your review though, I might have to 🙂 Thanks for sharing, Katy! I bet you’ll enjoy it, Elodie. Such a cool, true-to-life kind of story. It was an amazing book! I couldn’t put it down! I started the book at around 1:30pm and finished it at 10pm. I absolutely love this book! I thought so too. So incredibly well-written, and I loved the bittersweet ending.